28 • WRAPS • 2 0 1 8 WOMEN IN THE INDUSTRY BUSINESS & SALES A: Of course. When clients nd out a female installer is the one who did that wrap on their car, they are amazed and shocked and just can't believe their eyes. I get that reaction more often than not, and it never gets old. Q: What drives you to stay in the industry? A: I love everything about the industry. It's a way to show how unique someone is. Every day it's something new, and I can honestly say I wake up every morning ready to wrap. It's not a job to me, it's a hob- by. I get to wake up every morning and wonder what kind of crazy design or crazy car I'm going get my hands on this time; as opposed to sitting at a desk or some other boring routine. I love wrapping and I'll always love it! Q: How do you see the role of women evolving in the industry? 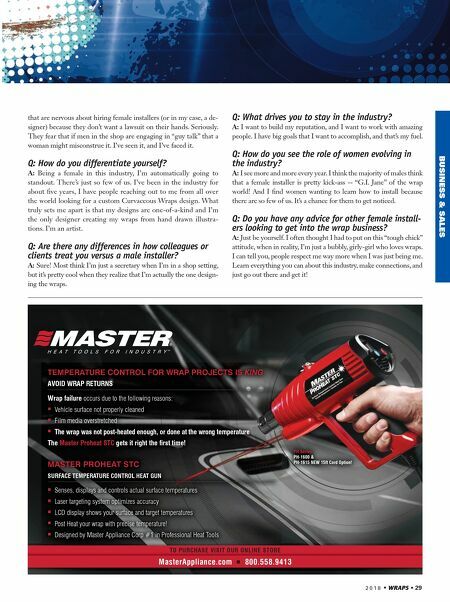 A: It's extremely rare to nd a good female installer in the industry. Right now they are hard to come by, but I know of a few very talented females out there. Q: Do you have any advice for other female install- ers looking to get into the wrap business? A: This is an extremely physical job and does require a lot of skill, but if you work hard and train for the best then the best is what you'll be. I'll never stop looking for new ways to learn and expand my knowl- edge on wrapping. 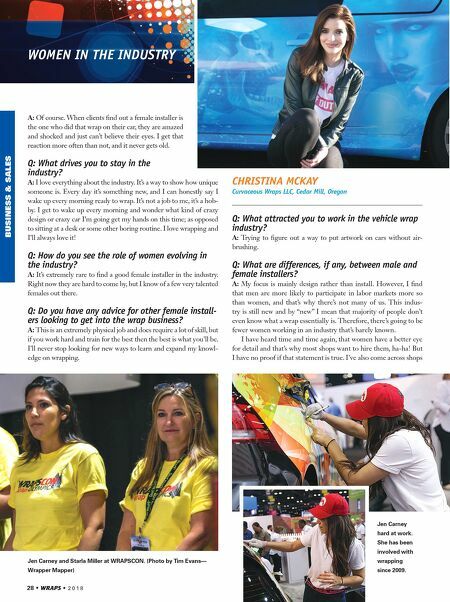 CHRISTINA MCKAY Curvaceous Wraps LLC, Cedar Mill, Oregon Q: What attracted you to work in the vehicle wrap industry? A: Trying to gure out a way to put artwork on cars without air- brushing. Q: What are differences, if any, between male and female installers? A: My focus is mainly design rather than install. However, I nd that men are more likely to participate in labor markets more so than women, and that's why there's not many of us. This indus- try is still new and by "new" I mean that majority of people don't even know what a wrap essentially is. Therefore, there's going to be fewer women working in an industry that's barely known. I have heard time and time again, that women have a better eye for detail and that's why most shops want to hire them, ha-ha! But I have no proof if that statement is true. I've also come across shops Jen Carney and Starla Miller at WRAPSCON. (Photo by Tim Evans— Wrapper Mapper) Jen Carney hard at work. She has been involved with wrapping since 2009.